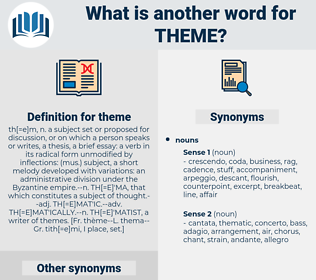 What is another word for theme? devoted, Feared, covered, Discussed, scared, raised, Dealt. Comes, Fears, Worries, deals, Focuses. messages, solutions, Summaries, subjects, item, items. 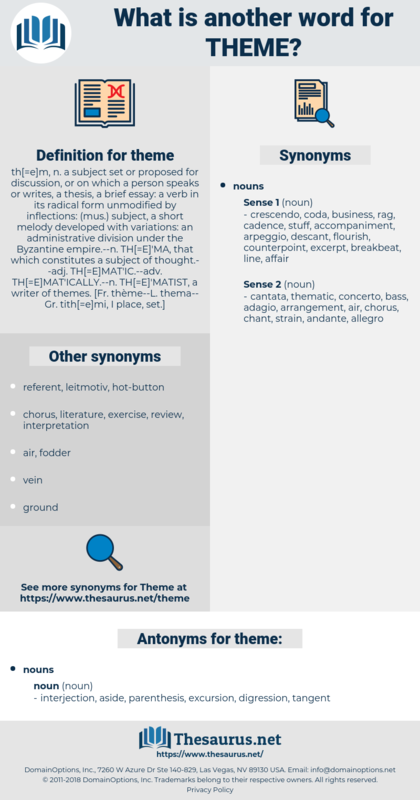 leitmotif, motto, leitmotiv, sub-theme, questions, slogan, motif, tagline, thread, item, items, watchword, amusement, title, thesis. interjection, aside, parenthesis, excursion, digression, tangent. The theme is the material love and splendid courage of a woman.